The Cocker Spaniel is one of the oldest spaniels known. It descended from the original spaniels of Spain and were used to hunt in dense cover. The breed was divided into seven spaniel breeds; English Springer, Clumber, Field, Irish Water, Cocker Spaniel, Sussex and the Welsh Springer. 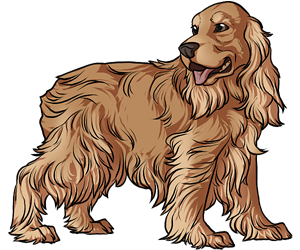 The only difference between the Springer and Cocker Spaniels was size until 1892 when they were officially recognized as different breeds. The English Cocker Spaniel Club of America was formed in 1935. The English Cocker Spaniel was officially separated from the American Cocker Spaniel by the AKC in 1946. "Cocker" comes from the game bird woodcock.